At that moment a blackbird sang amid the “willow-herb and meadowsweet and haycocks dry” – and in a moment of sublime tranquillity the poet hears “all the birds of Oxfordshire and Gloucestershire”. Paradise indeed. It was the end of an era. Or was it? Astonishingly, in our modern world where the proposed HS2 is threatening to tear up our countryside, there are still many delightful Adlestrops around the national network – tiny picturesque stations that have slumbered quietly on through decades of cuts and closures. Some have only one service a day, and a few just a single train a week. Several have fewer than 100 passengers a year – and there are more than 150 stations where the train will not stop – unless you put your hand out to flag it down or tap the shoulder of the guard to give advance warning. Among these request stops is tiny Dunrobin Castle in the Scottish Highlands, the private station of the Dukes of Sutherland, where you can step off the train directly through the gates into one of stateliest homes in Scotland. The trainspotter third Duke, who built it in 1870, even had his own personal locomotive and train. Buckenham station, deep in the Norfolk Broads, is kept open strictly for the birds – the feathered population at the bird sanctuary is on its doorstep vastly outnumber the annual passenger total of just 79. Whatever happens, don’t miss the train at Denton, east of Manchester – there won’t be another along for a week. But be warned. You will need to arrive early to position yourself on the platform so the driver can see you. And at your destination you may look in vain for a toilet, taxi – and sometimes some shelter from the rain. Still, unexpected joys await the intrepid traveller. At Berney Arms, Britain’s smallest station, you alight at a platform just one carriage long, built in the middle of a marsh so squelchy that brushwood had to be laid beneath the tracks when it was built. There are no houses in sight and the nearest road is three miles away. The skimpy platform shelter has all the space of an upright coffin with a hole in the back to stop it being blown away. But all around is an earthly paradise of boundless horizons, reedy dykes and soaring birds. And silence. Miraculously a short walk away there’s a pub when I get a hero’s welcome and some delicious chicken in the basket from the landlord whose trade depends almost entirely on the arrival of the branch line train. Sometimes the impossible happens. Who would imagine that travelling along the scenic railway from Exeter to Barnstaple, dubbed the “Tarka Line” by the tourist office after Henry Williamson’s book, that you might actually spot that rarest of creatures, the otter. Yet no sooner had my train clattered off from Umberleigh in the lush Taw Valley than, in the silence, I snuck up on a whole family of them nesting not far from the railway bridge. Arriving at a request stop halt to catch a train can be both an exhilarating and unnerving experience. Such power to be able to flag down a 70-ton Super Sprinter just for yourself! The rules say you must “raise your arm so the driver can see you”. But what happens if the train fails to turn up? A moment of panic as you check whether that faded timetable flaking off the noticeboard is still current. Perhaps you have hiked for miles and yearn for a return to civilisation, a hot meal and a pint. It happened to me at a windswept halt on the remote Cumbrian Coast line near Sellafield as rain lashed in off the Irish Sea. It was surreal to have to ring through to baking Bangalore to reach the National Rail Inquiries call centre – where they predictably hadn’t a clue. Luckily, the signalman in his crumbling Victorian wooden signal box allowed me to toast my toes on his fire over a steaming enamel mug of tea until the train arrived. Not as long a wait, though, as at Reddish South in Greater Manchester, where the solitary weekly train departs at 10.20am on Fridays only for the 16-minute journey to Stalybridge. This is one of Britain’s “parliamentary services” – “ghost trains” on lines in a railway netherworld, retaining the minimum service under law, because the authorities can’t quite get round to closing them. Reddish has probably the most primitive facilities of any station in Britain, with just a bare asphalt platform, no seat, nor even any lighting. Yet you might find the “Stalybridge Flyer”, as it is known, busy, since it is a favourite with “gricers” – enthusiasts who travel round the country to “cop” a rare train. You can make up for the privations by tucking into some black pudding at the Stalybridge buffet, regarded by many as the best platform refreshment room in the land. 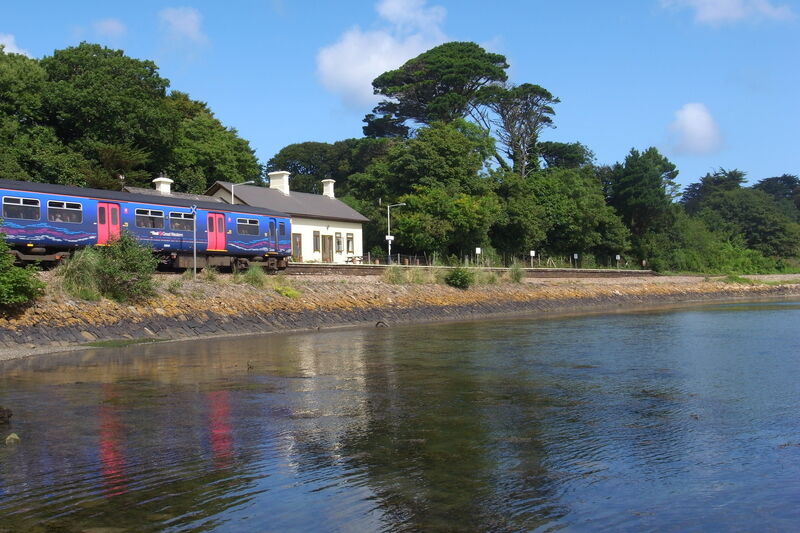 For me, it was more romantic to head to Cornwall and take the little branch from Liskeard to the picturesque fishing village at Looe, stopping the train at the magically named St Keyne Wishing Well Halt – one of only two stations on the network with the word “halt” still in its name. The well is a few minutes up the hill from the platform and gets its name from St Keyne, a fifth century holy woman who imparted magical powers to the waters, whereby “whichever of a married couple should drink of them first, he or she would have mastery of their wedded life”. In Victorian times, couples would leap suicidally from the train in a desperate race to gain household supremacy. Canny travellers, though, will beware of being seduced by quaint names. Stopping the train at Pleasington, on the line from Blackpool to Colne on the edge of the Pennines, I find out too late that it is anything but “pleasing” – a landscape in the heart of industrial Lancashire with dumped supermarket trolleys and other detritus littering the lineside. But while it may sometimes seem as though the unstaffed request stop is a symptom of a clapped out railway on its last legs, it very often represents the opposite. Some railways would never have been built without them. In Edwardian times, Colonel Holman Stephens, Britain’s most eccentric railway proprietor, presided over a national network of tiny railways from a terraced house in Tonbridge in Kent. Without the Colonel’s rickety tracks, ramshackle carriages, Heath Robinson engines and request stops on lines with quaint names such as the Snailbeach Railway and the Hundred of Manhood Tramway, many country villages would have remained unconnected to the modern world. These days, thanks to a coalition of volunteers from the Association of Community Rail Partnerships, once-threatened stations are cherished again, and tiny halts thrive, with brilliant splashes of colour enlivening lovingly tended platform flowerbeds. On the Tarka line, the number of passengers has doubled since Beeching days and request stops at smaller stations are crucial to keeping up the speed of the hourly service – as well as saving fuel for the trains. At the same time, elderly ladies can board at will from tiny Yeoford to change their library books and farmers get to market from Morchard Road. This tiny halt, between Salisbury and Westbury, is still open today if you feel like casting a line in the well-stocked local lakes ­– though Betjeman’s prediction in the poem that steam trains would one day return proved wide of the mark. So, let’s say hurrah for delightful Dilton Marsh and all the request stops and remote platforms, with all their evocative names and eccentricities. As the spring sun warms up our green and pleasant land, think of what charms await – at Corkickle and King’s Nympton, at Sandplace and Saundersfoot, at Wrenbury and Wood End – all for the modest effort of flagging down a train.